but the trained eye can get a lot of information from it. be more comparable and stable. able to see “setups” where Currencies themselves are "distorted"
of profit, in a particular direction Long/Short. EDIT: link changed, and more online charts available. 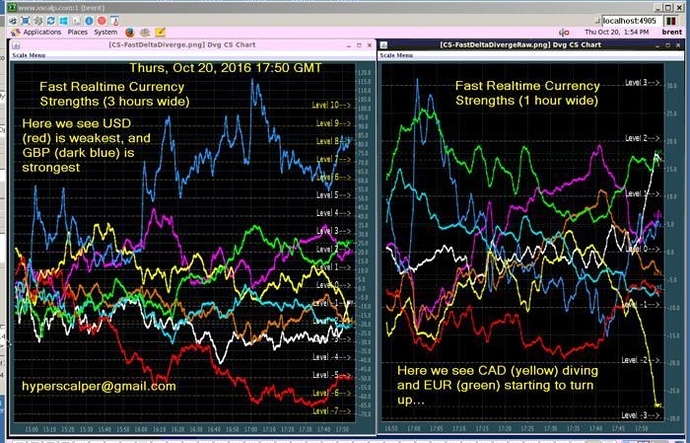 EDIT: Desktop app is replaced by server-based realtime charts. as a “technical fundamental” factor in FOREX trading !! useful information for medium to longer term trading. trader to “fade” Currency relationships, looking for a "collapse"
Currency Pair perhaps 10 PIPs or so. Limit Orders rule !! 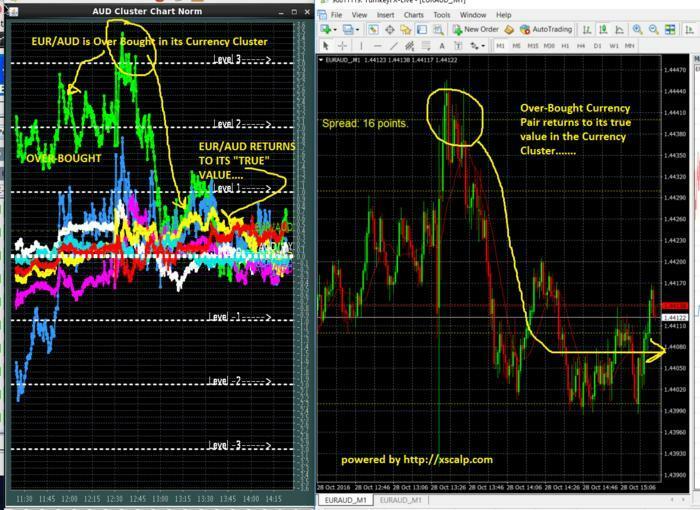 able to see where Currencies themselves are being moved as "setups"
prior to major fundamental News Events, etc. common value, 8 hours prior, and we can see a “magnified” or "enhanced"
trade opportunities just PRIOR TO major news events. to predict and to trade. This OBOS display can show all “distortions” but that is not very useful. So it will "filter"
a moving average reference, obviously a good candidate for a LONG trade. the trades should be taken. Download Page | The XScalp Private Server page currently provides these downloadable screenshots. 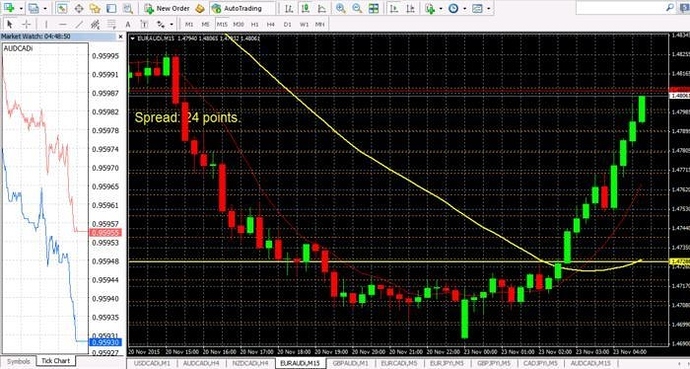 so that you can begin to understand what this method of trading involves. we can begin to identify both 1) trends, and 2) “setups” . move OPPOSITE on a specific upcoming news event which affects that Currency. Looking for “suspicious” movements helps to identify these opportunities. 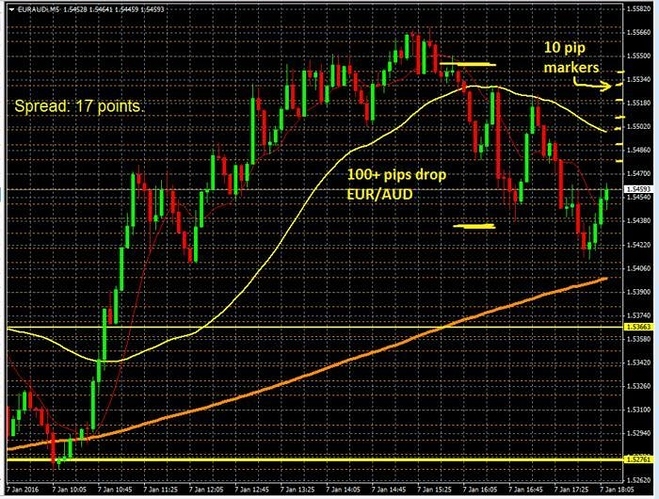 Short in AUD/CAD Currency Pair based upon that interpretation of the data. that we are viewing a “setup” in a particular Currency Strength. 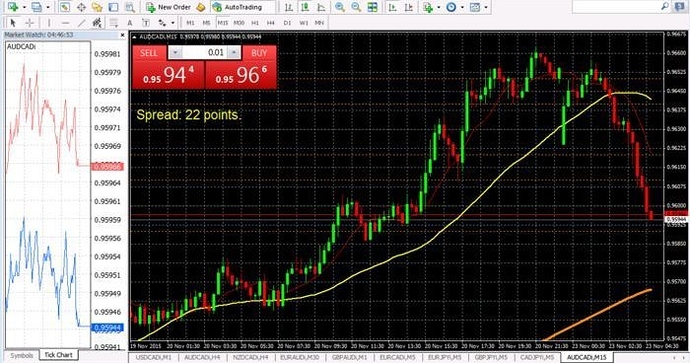 "day trading" opportunities which are also possible using Currency Analytics. For more information you may contact me. Short AUD/CAD and Long EUR/AUD were successful. propose we focus on the deeper Currency Strength concept. the highest probability trades, and to know the direction (or “side”, long/short) of the trade. For this type of trading I choose to focus upon 28 major Currency Pairs, which are “driven” by the 8 major Currencies. It’s important to distinguish clearly between a “Currency” and a “Currency Pair”. Currency Pairs (aka exchange rates) are what Forex traders trade. A Currency Pair is a ratio or fraction with a “quote currency” and a “base currency”. if either (or both) A increases, and/or B decreases. the largest movements. This is also a part of the trading methodology proposed. using this new method of trading. A few comments about the attached 2 day historical view of Forex Currencies. expect the Currency to move in the opposite direction. than the AUD movement, as you can see. We could also have paired the EUR with another Currency potentially as well. behind its successful deployment for profitable trading. should be used to choose Forex trading pair opportunities. and here we choose EUR to sell, against the weak AUD. unfilled, no harm no foul. markers are shown for scale. It’s been a while since I posted anything to this thread. often free, and are “completely useless”. Currency Pair to trade, as well as the direction. It worked for Medium to Longer term trades, for the "big"
moves; but also for very short-term trades as well. not in the retail space anyway. NJ4X.com API into “pools” of MT4 “terminal.exe” processes. are called the “Fast Delta Divergence” charts. 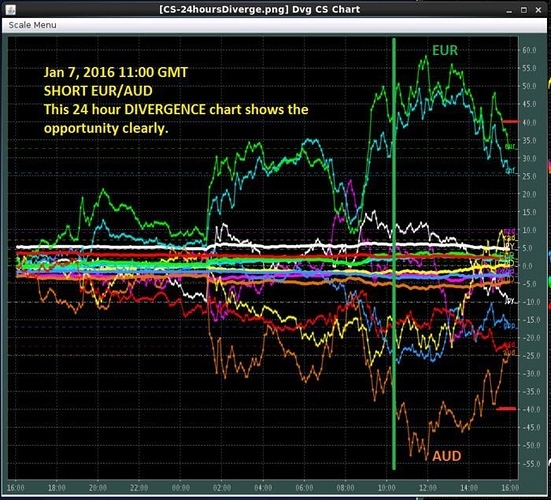 They are "divergence"
but you at least gain access to the indicators in a Browser. to strengthen and “go with it”. advantageous Cost Basis while we are waiting for Price to turn. a Trend has been “confirmed”. But we don’t do that. Valuation of a Currency is relaxed. 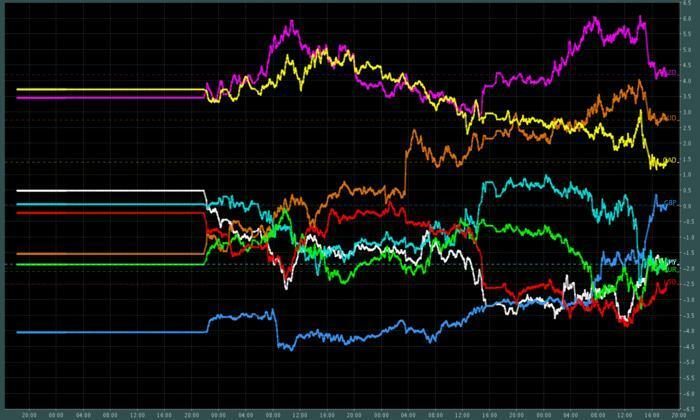 observations of that Currency within 7 Currency Pairs. is the “nominal” target for this type of scalp. "Currency Meter Scanner Forex or Nadex Scalping with Cluster Divergence "
one column also says “rel. volume” any ideas what is it? in USD strength into the close of week trading in Forex. It’s been quite a while since I updated this thread. So much work going into software and especially BOTs to use the Currency Analytics data. BUT… one indication has emerged as particularly “Holy Grail” like in its ability to pick out genuine opportunities. This concept involves estimating the “expected or true value” of the Currency Pair price, but noticing a significant over- or under-valuation of the normalized index price for that Currency Pair. Once we have this information, we proceed to evaluate whether it MIGHT BE a “false signal” due to Over-Valuation in Recovery from a bottom, or Under-Valuation during a Collapse from a high. Except for these Caveats, which result in “false positive” signals, the vast majority of Signals in a Market “steady state” situation are Valid and Correct for Over- or Under-Valuations, which provide opportunity for SHORT positions or LONG positions, respectively. I’ll post a visual example of this in action, as there are many such examples. In only a small proportion of cases discussed above, the opportunity may fail to show the desired results. Here is an example of the significance of the OBOS Indicator in real time. UPDATE ON AUTOMATED TRADING BASED ON OBOS. First of all, apologies for such a gap in time since my last posting. at roughly 12 pip intervals, thus providing “cost basis” improvement. exists in a much more complex custom runtime environment. One of the goals of over a decade of working on this problem is to be able to “see” the “underlying trend” before the Price makes its move. Forex traders have a limitation that there is no “Time and Sales” available, which would allow for calculation of “Net Inventory”. The retail Forex trader lives in a decentralized market in which there are “ECN” pools perhaps but there is no centralized Time and Sales such as would be available in Futures markets through the CME, for example. However, there is one brokerage in Switzerland, Dukascopy, which does provide a Market Depth feed. And from a Market Depth feed sufficiently rich, it is possible to make inferential derivations of a Time and Sales. The existence of a Market Depth in near real time, allows us to view the sizes and prices on the BID side versus the ASK/OFFER side of the Market in the ECN which is being exposed. From this, we can derive a “virtual” Time and Sales feed for Order Flow, but let’s leave that for later. What we’re considering now is just “the balance of the Depth of Market” or, as it is called “The Book”… Sometimes, this is called “Level 2” information but it opens a whole new world of information for the Forex trader. While Dukascopy will not grant Live accounts to U.S. persons, there is a quality DEMO feed which is available to everyone. If you are a non-U.S. person, then you have a rich source of advantage IF you are able to fully exploit the Dukascopy Market Depth feed, and perform near real time computations. TREND. Most of us want to “follow the price trend”. Obviously, that’s how you make money, by staying in a trend until price moves enough so that you have a comfortable profit. There is another, more subtle aspect of Size on the Depth of Market. And that is the “distribution” of size. What is the volume weighted average distance of the Sizes at each Price, from the inside market? Again, “Price moves to Closest Size”. The side of the market where the mean distribution of Size is closest to the market, is the direction in which Price will be moving. Again, Price is “pulled” toward the more “aggressive” advertised Size, which is that nearer to the inside market price. So long as the “Size Bias” remains on one side of the market, the Price Trend will continue in that direction. It’s simple, but difficult and subtle to measure. I’ve just started graphing this information, but the attached will show what I mean with Price versus Size Bias. As you can see, the downtrend in price continues so long as the Size Bias remains down, on the BID side of the Market Depth. SELL USD in a “Cluster Basket Trade” on Friday Close. 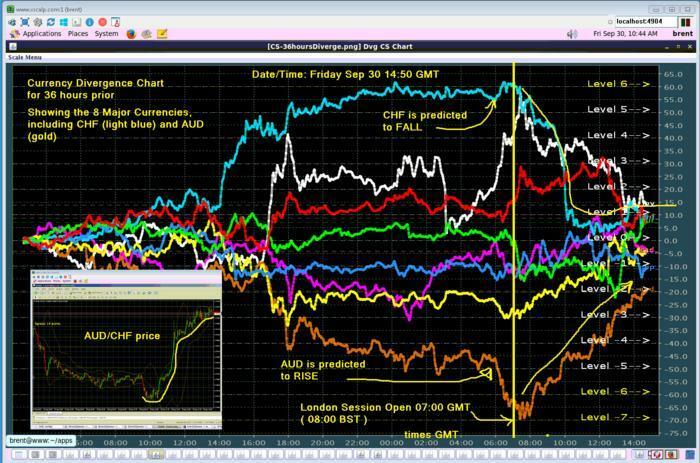 And so this is a clear demonstration of the effectiveness of Currency Trend information in Forex trading. The image is from a private Whatsapp chat group.